Santa Clara Brick Company warrants that its product exceeds the severe weathering standards indexed by the American Standards for Testing Materials in effect at the time the warranty. This repair or replacement warranty does not cover damage due to deterioration resulting from improper building practices, settling or subsidence of the ground, use of brick for sidewalks, paving for foot and vehicular traffic, mailboxes, soil dams or certain other limiting conditions. You are encouraged to read the complete description of the remedies, limitations and exclusions written in the warranty itself. Your Master Brick sales representative will be happy to provide the warranty document for your review. This limited warranty can be transferred by the homeowner to a subsequent owner as part of the sale of the property. 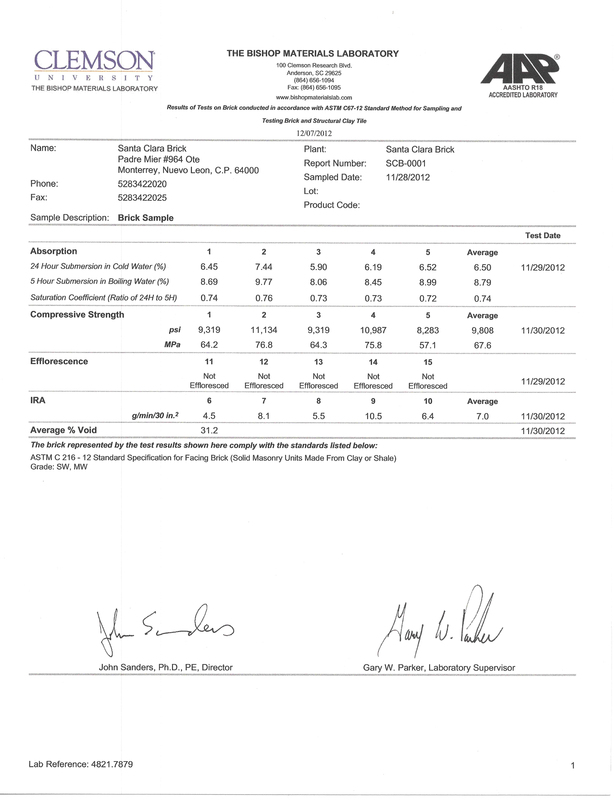 To see Master Brick's most recent test results preformed by Clemson University, click here.